Developed in 1988 as a grand, one off floral tribute to mark Australia’s Bicentenary and Canberra’s 75th anniversary, Floriade has become Canberra’s most iconic annual tourism event and Australia’s premier spring festival. The floral display of more than a million bulbs and annuals planted across 8,000 square metres of inner city parkland is more than just a flower show. If one million bulbs and annuals weren’t impressive enough, Floriade presented its popular after-dark experience NightFest across five illuminated nights in 2016 and is excited to do so again in 2017. Visitors explored amazing outdoor lighting design and production, curated and constructed by the expert team at Mandylights. They designed a parkland-full of impressive lighting installations which excited and delighted. Complementing the bazillion LED lights incorporated into inspired lighting designs, NightFest hosted a swathe of roving entertainment delighting those wandering through the wonderland. Illuminated wonderland – Explore the whimsy and the beauty in outdoor lighting design and production, as curated and constructed by the expert team at Mandylights. They’ve designed a parkland – full of impressive lighting installations which will excite and delight the fairy light lover in anyone. The Marketplace – To indulge your inner foodie (and food critic), we’ve created the Marketplace; a food, wine and beer bazaar hosted in the The Kitchen Company Tasting Plate, during NightFest. Explore the food and beverage crafts of Bentspoke Brewery, Pialligo estate, Mount Majura vineyard and more, in a melting pot of top local and regional talent. Costs for upgraded Nightfest Tickets, Breakfast and more available on enquiry. In March 2017, My Travel Expert has a fantastic short tour of Tasmania coming, covering the highlights of Hobart and surrounds. Spaces are limited, and if you have ever wanted a taste of Tasmania then this fantastic little 6 day getaway is your chance! $1590* Per Person in Share Twin. Tour Highlights Include: Salamanca Markets, Wrest Point, Bruny Island, Port Arthur, Tasman Peninsula, Sea Cliffs Blowhole, the Devils Kitchen, Doo Town, Tasman Arch, the Botanical Gardens, Mount Wellington, MONA Museum, Rosny Point Lookout and more! *Please Note: $200 deposit due within 7 days of booking. Final balance is due 60 days prior to travel. Tour price based on a minimum of 30 travellers, if the end traveller number is less prices are subject to re-evaluation. (02) 4421 5577 and ask for Julie! Guess Who has been travelling? Julie has just recently returned from escorting one of our Group Departures along the Danube. A fantastic trip visiting Prague before cruising from Budapest to Amsterdam, then onto Paris for a few days R&R before heading home. If you have been following our blog and website over the past 18 months or so you may have noticed us promoting this upcoming trip from time to time. I know, there are not a lot of “site photos” but if all we did was show you those what incentive would you have to join us on our departures! 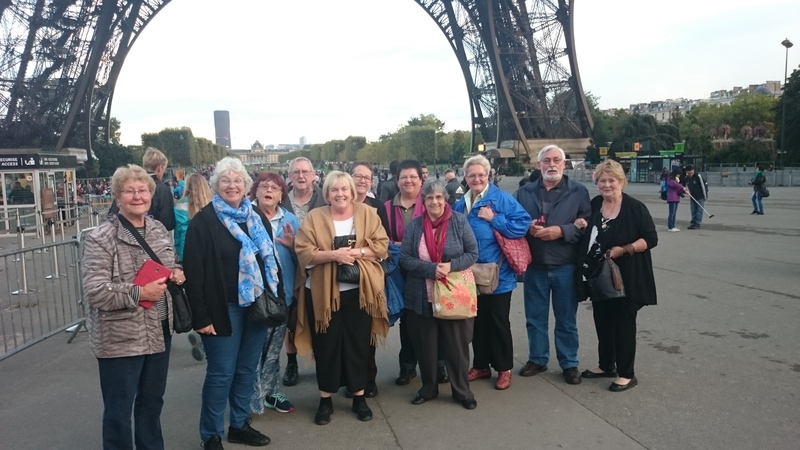 In any event there was a lot of fun had, and if you want to join us on a future trip then take a look around the website to see what is on offer! Take A Hand In Shaping Your Egyptian Experience! Have you ever wanted to explore Egypt? To walk the great Hypostyle Hall at Luxor (Image below), to sit back and enjoy High Tea at the Aswan Hotel where Agatha Christie wrote Death On The Nile, or spend some time browsing the shelves of the Great Library of Alexandria? Then you are in luck, in January 2016, My Travel Expert and Shoalhaven Solo Sisters are running a group tour to Egypt that will take in the best of Cairo, Alexandria and the Nile. Our plan is to run a trip of between two and three weeks, including all transport, accommodation, sightseeing, entrance fees and much more. We are not just doing what we want though, and encourage you to come in and join us on the evening of Wednesday the 14th of January 2015 to hear what we are planning and let us know what you would like included! Golden West USA Special – Grab It While Available !!! The Golden West USA Tour we have departing in October 2014 retails for 5359 per person in share twin for an 18 day tour programme including flights, a price we believe is reasonable, if we didn’t we wouldn’t have used it for our solo sisters departures. We have though been speaking to our providers and have managed to make that price even better, and can offer you the tour package at a fantastic cost of AU$3403 per person in share twin .. that is a saving of AU$1955 per person!! To take advantage of this special all you need to do is book before the end of January 2015, and pay in full before the end of February. What though is going to be seen on this trip, where will be visited that will make you want to outlay this sort of money? The truth is that this trip sees the best of the west, with the major sights entrance fees included and plenty of time for you to get out and explore on your own the sights you may wish to see – be it Madam Tussauds in Las Vegas, the infamous Pier in Santas Monica or the shopping malls of Beverly Hills. With the group we spend 16 day touring from Los Angeles to Los Angeles, taking in Flagstaff and the Grand Canyon, the bright lights of Las Vegas, the incredible natural scenery of Mammoth Lakes and Yosemite National Park, the iconic city of San Francisco and the beautiful coastal towns of California! In the last twelve months we have had Kelly, Julie and Leonie all scout out some of the fantastic locations that this tour is going to and all three have had a ball encountering the “Golden West”, enjoying everything from the scenic flights over the Grand Canyon to testing their luck at the tables in Las Vegas. You can review the tour in full here on our website – just click here – and you can see whats included, what is going to be seen and where is going to be visited. So if you want to take advantage of this incredible offer and book aboard for just AU$3403 per person in share twin then give us a call today on (02) 4421 5577 or email us at nowra@mytravelexpert.com.au !